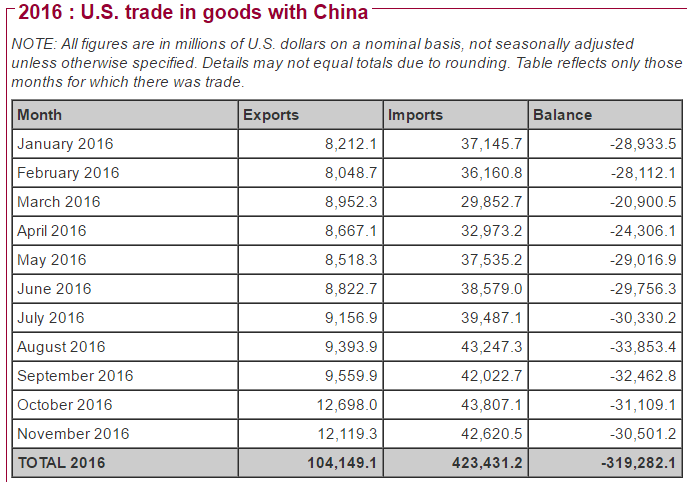 OMG: US Debt with China: $1 Trillion + $360 Billion Per Year Active Trade Deficit! You don’t hear much about the massive US Trade deficit on the major TV networks. NBC, CNN, CBS, or ABC rarely mention the insidious debt with China and Mexico. You’d think that a number like $20 Trillion (estimated shortly), $61 Trillion Total Sovereign debt, and a $1 Billion per day deficit would be CNN’s headliner every single day. Instead, CNN and the rest spend all day attacking Donald Trump. 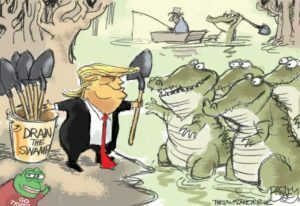 But then, Trump did say he was going to drain the swamp (including judges). Unfortunately, Trump is launching another debt-driven campaign which may overheat the economy and grow the debt at more than $1 Trillion per year. Since it’s going into infrastructure spending with private participation, it’s not as toxic as Obama’s debt. However, Trump did say he wanted all shelves filled with nuclear bombs which is pretty much insanity. As a result, he’s paying the price in the media for doing good deeds. Let’s hope he gets these things done before he’s impeached for conflict of interest. Because the US is in big debt trouble and Trump is the only one with a solution. And how ironic it would be if the US becomes seriously indebted to Mexico! Yet, it’s a taboo topic lurking in the dark. But when interest rates rise, this villian will walk through the curtains and into the limelight. Are China and Mexico taking advantage of the US? The huge debt won’t go away. Rising interest rates to pay the interest on the debt could get out of control. That could impact the housing market and whether people buy homes. There’s no bubble / crash in foreseeable future, especially with Trump beginning to take control, and as we see investment funds arrive back in the US. The stock market is at a record pace. Families and individuals need homes. Perhaps what’s at stake is who will be the landlord and who will be the renter. There’s big money in rental property investment and the Chinese have been buying. However, due to Trump’s actions, the Yuan will plummet and Chinese investment will soon be a thing of the past. Forecasting the Economy: Where Should you Work, Invest and Live in the Next 10 Years? So why don’t we look at the debt’s source, the numbers, the process, and consider what will happen if Donald Trump does manage to improve the situation. You’ll find some eye-opening data, infographics, links and commentary in this post. Make sure everyone knows! It’s your civil duty. This post will be constantly updated so please bookmark it and share with your contacts. And although Americans assume everything is good right now with “full employment” there’s a big “debt catch” with Obama’s legacy. With $500 Billion overall deficit in 2016 and almost $20 Trillion overall, the spirit, vitality, hope and wealth of the US is persistently eroded. The reason for the media silence is denial, and the so-called economic expert’s inability to make an emotional impact with Americans. There is no coincidence that the deficit has coincided with America’s slide into despair the last 20 years. “Our nation stands at the crossroads of liberty. Crushing national debt, rampant illegal immigration, insane business regulations and staggering national unemployment are pushing our nation into unchartered territory.” — James Lankford from Brainy Quote. Some suggest China may even threaten or blackmail the US over trade sanctions by calling in that debt. Doubtful, but how was this debt situation allowed by the US government? Please Share this Post with others. Everyone around the world should know about the US national debt and deficit. This is something no 4 year job recovery can eliminate. “I think it really scares us that we’re staring at $20 trillion in debt, not knowing how our grandchildren will repay it,” says Bob Kuck, a retiree living in a gated community in Sarasota, Florida — from CNN’s report: Is anyone worried about America’s $19 trillion debt? by Heather Long. Of all the threats that America faces, it’s the quietest one that could bring the country down. Some may wonder if it’s too late for the US government to do anything about. And before Trump became President, he recognized how miserable the prospect of dealing with this gigantic national debtload is, grow the housing and investment outlook, and bring back good paying jobs. But he took the challenge anyway. It’s either heroic or suicidal. Tens of millions of millennial students having already been wrung through the US college educational system. They spent 4 to 7 years for an expensive education they’ll barely use along with a a whopping $1 Trillion in government backed student loans. They will be paying for all of it and Gen Z’s will be joining them. But don’t worry, Trump’s got a plan for you. The purpose of the education system has been to create great jobs for teachers, not for educational efficiency and productivity. As Trump brings jobs back, the question is whether these stressed out, indebted, wrongly educated workers can step up to the plate. I think we’re all optimistic the kids will bale us out. And what Americans can’t do, you can easily immigrate to fill. Make America Great will be the slogan of Millennials shortly, but they’ll never forget all the debt. The US National Debt with China alone has now grown to $360 Billion per year. 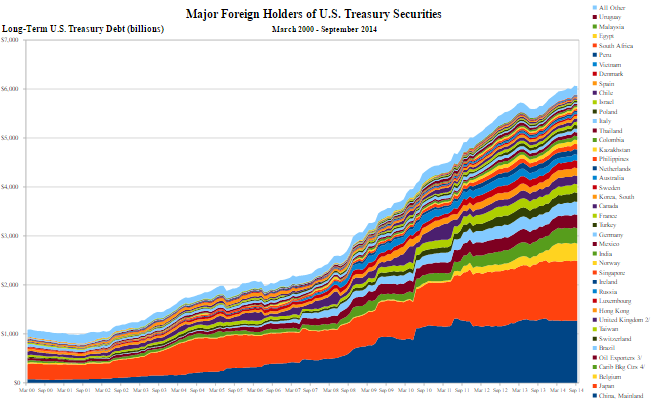 In a 6 year span, that is $1.6 Trillion, $4 Trillion since 2000. Just to pay the interest on that debt is a sizable chunk of US GDP. Donald Trump says he’ll tackle it, but the last time I saw a mouse attack a Lion, the outcome was not favorable for the mouse. 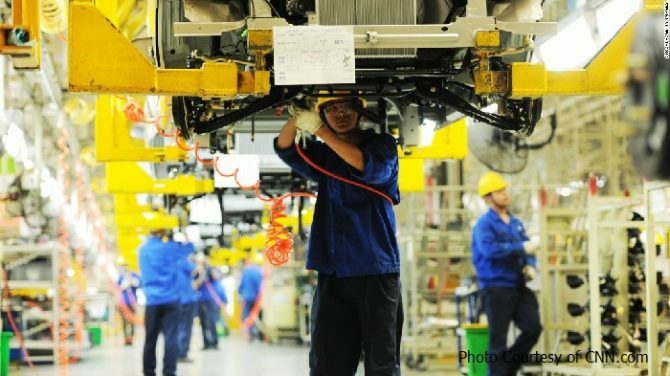 The picture the media presents of China is still one of impoverished yet diligent and deserving workers glad to have a job. But China’s not like that anymore. China is rich. 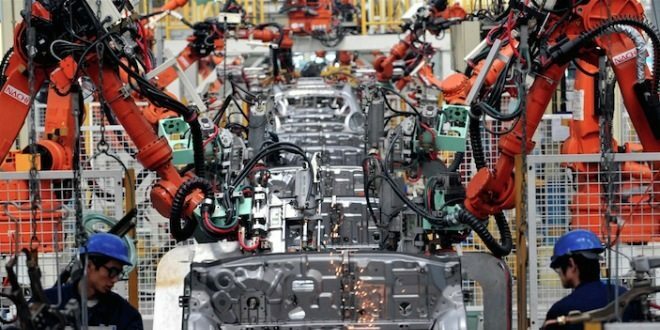 China’s robot factories are growing fast which has raised concerns about millions of layoffs of Chinese workers. Only a smaller number of engineers and technicians might be needed. Now they may have unemployed robots as well. Why Is the US National Debt so High? The persistent trade deficits are a big reason. Obama/Clinton never talked about it, in fact, Obama spent $8 Trillion in the terrorist aftermath. A good portion of that handout was never traced. They don’t even know where that money went. The debt to China directly is now over $1 Trillion. 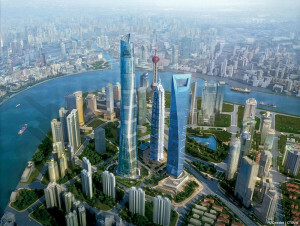 Now China is able to buy up property and companies here like it’s a fire sale. Another reason for the debt is Free Trade. While free trade was a theoretically good idea 20 years ago when I was studying International Business and Trade in college, it’s no longer so. Today, it’s a losing business concept for the US. The fact US investment dollars are going to former third world countries to benefit their economies and creating jobs for them instead of in the US is bad enough. Further, these countries (China, Mexico) manipulate their currencies to keep an ongoing and artificial trade advantage. As Trump suggests, they play the currency markets like Candice Swanepoel plays the fiddle. China isn’t so genius at it though. They just demanded it. I have to say that I’m saddened that Richard Branson invited Barack Obama to Necker island, and that he’s also asked the UK government to reconsider leaving the EU. 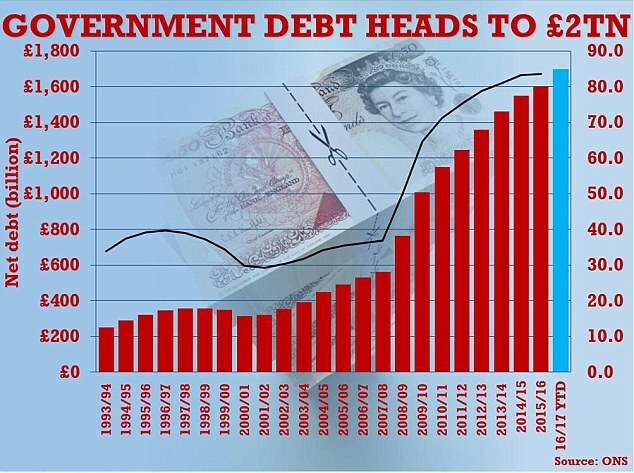 The UK has it’s own massive deficit, which deserves its own blog post. This picture tells it all. The UK had to leave the EU. Brexit was a survival decision not a new vision for the UK. When free trade theory was idealized and touted strongly decades ago, they didn’t consider the effect of currency manipulation and the ongoing human rot that occurs with overspecialization. And they wouldn’t admit to where it would lead. 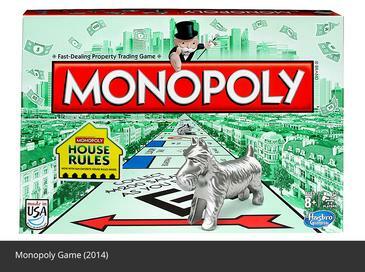 The game of monopoly is the same. Inevitably, one player claims everything. In the real world, countries make excuses for cheating and not being fair. Worse, countries can specialize themselves out of existance. When countries have no options left, amidst cheating, it can lead to wars. The economic theories of specialization and economies of scale works wonderfully, until the rising countries have all the investment money and a continuous way of beating the falling countries. If the free trade situation persists, countries like the US and the UK will continue to collapse. They collapse because their overspecialized workforce/businesses get caught in trade and technology circumstances, the same way an unemployed worker in Ohio or Michigan finds themselves suddently without a job through no fault of their own and their home is valued as worthless. When countries grab up a monopoly on technology, distribution, investment flows, jobs, skills, education, etc., it’s unfair. Right now, Americans have limited job opportunities. And should an American want to be an engineer, or other high tech workers, they may have to move to Mexico or China. Some like the Democrats, want this situation to continue forever. The fact is, the skilled, sustainable, good paying jobs must return to the US, if only to pay the national debt. What are your thoughts on the jobs outlook for 2017, 2018, 2019, and 2020? Is free trade about to transition to fair trade? Will the housing sector survive the fight with the deficit or is a housing crash inevitable? Is buying gold a good hedge strategy?